The Dogs of Beer – Page 2 – Home of the Delaware Beer Blog – Drinker of beer. Writer of stuff. Wilmington, Delaware – Maine-based artist Heidi Geist hit the road in early September on a year-long journey to create artwork for breweries in each of the continental United States. Geist’s mass art project, appropriately dubbed The 48 Beer Project, will bring her to the newly opened Wilmington Brew Works at the end of this October. Geist has designed labels for nearly 20 craft breweries over the last three years at her Portland studio. When her lease expired, she was inspired to purchase a mini-school bus from eBay and convert it into a mobile studio with the intention of more directly connecting with her clients. Geist spent three months renovating the mobile studio, which she named ‘Fearless.’ She then conjured up the idea of nation-wide beer related project after a weeklong meditation. Geist carefully targeted partners in her project, selecting breweries who shared a similar collaborative ethos. She was particularly interested in partnering with breweries like Wilmington Brew Works, who are involved in their local communities and support art organizations and other charities. “When this building had fallen into disrepair it was a drag on the neighborhood and the city. We are excited to add purpose and meaning to such a beautiful building, and bring the spirit of experimentation back to this space! Partnering with the 48 beer project is an exciting way to begin an arts program here, where we can collaborate with local artists for future projects,” said Craig Wensell, CEO and Head Brewer. Having already completed projects in the New England states, New York, and New Jersey, Geist will be stopping in Pennsylvania prior to her arrival at Wilmington Brew Works on Thursday, October 25. Her work in Delaware will have a bit more permanence than the labels she created as earlier parts of the project. During her three-day stay, Geist will be creating artwork on two of Wilmington Brew Works’ wooden barrels. The artwork will become semi-permanent fixtures on display in the brewery taproom. Wilmington Brew Works is the first production brewery to be located in Wilmington’s city limits since 1954. Housed in a century old former laboratory in the Old Ninth Ward, we keep the spirit of the building’s creative origins alive with new and innovative ales, lagers, sours, ciders, and soft drinks. The company’s family-friendly taproom has plenty of indoor and outdoor seating to enjoy a drink with friends, both old and new. Playfully Pretentious, Easily Enjoyed. Tomorrow, October 13th marks the 21st time that Kennett Brewfest will open its gates to the beer loving public. While many fine festivals have materialized during those 21 years (and yes, sadly some have ceased) Kennett has grown into what I consider the template for a successful beer festival. From the food, to the music, to the sheer number of breweries, to even something as simple as having more than enough (free) water available, Kennett gets it right year after year. But what really raises the bar for this festival is its VIP session which it dubs the “connoisseur session”. 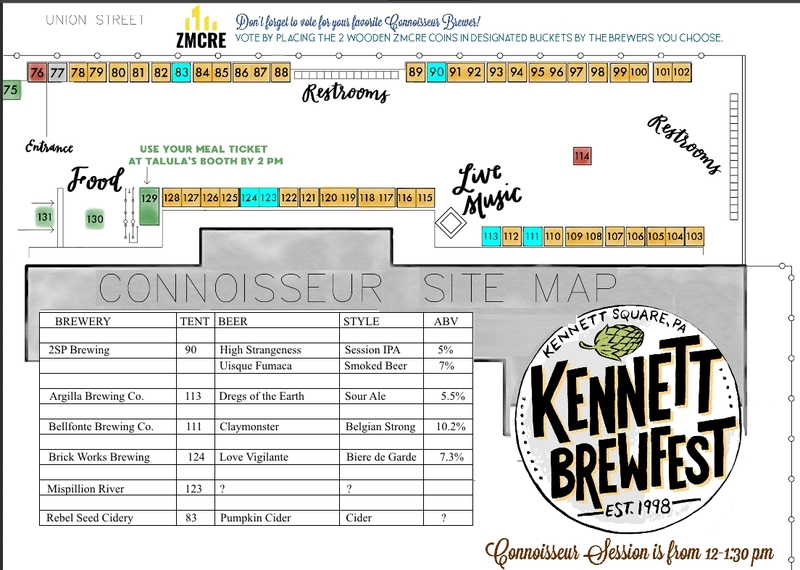 While other festivals VIP tickets get you into the event early, Kennett requests that the breweries participating in the connoisseur season bring something special, something unusual, or maybe even something rare, to pour during the one-and-a-half-hour period before the regular session begins. To be honest, with in the neighborhood of 50 breweries (just about half of the total attending) pouring during this year’s connoisseur session, it is practically its own festival and this year, Delaware is nicely represented. Below is an edited map for the connoisseur session highlighting the Delaware breweries that are participating this year, plus a quick rundown of what they will be pouring. Click here for a full map from the festival’s website, and if you were unfortunately not lucky enough to get connoisseur tickets this year (although they didn’t sell out nearly as fast this year as they have in the past) but you have tickets to the regular session, you can find that map here. If you’d like to print out the Delaware Map, simply click here, right click on the image and select view image. Then print from your browser, or you can copy the image or save it and print it from you favorite graphics program. Here’s what these Delaware breweries are planning on pouring at the connoisseur session (notice: plans change last minute and so sometimes do the offerings, so don’t take this list as written in stone). These breweries will also be pouring in the regular session (again, subject to change) along with fellow Delaware representatives Wilmington Brew Works, Twin Lakes, Dogfish Head (Seaquench, Liquid Truth Serum), and Dewpoint. Argilla Brewing: Tent 113 – Will be bringing their Dregs of the Earth, a barrel aged sour which currently rates a 3.83/5 on Untappd. Bellfonte Brewing: Tent 111 – Will be bringing their Claymonster, which has been described as “One Helluva BIG Dark Strong Belgian Ale!” (10.2%ABV). With nearly 100 check ins on Untapped, Claymonster has a rating of 3.8/5. Brick Works: Tent 124 – Will be pouring their Love Vigilante Biere De Garde, a recent offering from the brewery with the beer being added to Untappd as recently as September. It doesn’t have many ratings yet, but sits at a respectable 3.6/5. MIspillion River: Tent 123 – No word yet on what MR will be bring to the festival, but if the past is any indication, we shouldn’t be disappointed. Rebel Seed Cidery: Tent 83 – Hey, cider is more than welcome at a beerfest, and if you’re the type that can’t get enough pumpkin in your diet this time of year the fine folks from Marydel have you covered with their Pumpkin cider (3.73/5). 2SP Brewing: Tent 90: – OK, I know, Aston PA. but come on…we still consider Mike and the gang as family, right? The guys will be pouring two beers: Uísque Fumaça, a smoked beer (4.09/5) and their recently brewed High Strangeness, a session IPA (3.69/5).